Summer in San Francisco means bringing hot chocolate, puffy coats, and knitting to watch my cousin's evening soccer game at Golden Gate Park. My friend made some fantastic hot chocolate to which she added a touch of cinnamon. I had brought leftover, unfrosted lychee-coconut cupcakes for dipping, which were great, but I wished we had some churros to dip instead. 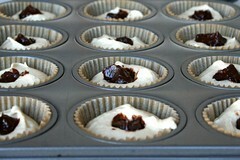 From that came this week's ambitious cupcake. Ambitious it was and most everything was great, but my frosting experiment didn't quite pan out. The flavor combination worked for me. The cinnamon cupcake was subtle, tender, and not too sweet. The chocolate filling provided a nice shot of deep chocolate flavor that again wasn't too sweet. These would dip nicely in hot chocolate, for sure. I was experimenting with a new kind of frosting which didn't work out at all (so I will not even post the recipe, yikes). I think a simple chocolate ganache would work out just fine. 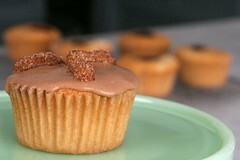 The tiny churros were fun to make and tied in the inspiration of the cupcake. 7. pipe tiny churros directly into the hot oil, squeeze the bag allowing the mixture to come through, then chop it off with a butter knife when its about an inch long. What a great combination. Truly delicious looking cupcake! This is gorgeous. I love churros, so the idea of putting it in a cupcake is awesome. Great post and yummy looking picture. I'm going to attempt to make these cupcakes this weekend. It will be my second of your recipes. I love your photos and the icing shown looks so yummy. I'm thinking a "hot chocolate" inspired icing might be nice. My question to you is... why Vietnamese cinnamon? I'm sure I can find it in a speciality store, but I'm wondering what the difference is. You should be fine without the extra-fancy... I used it simply because cinnamon figures so prominently in the recipe and Vietnamese Cinnamon is the sweetest, strongest you can get. I should do an 'America's Test Kitchen' style tasting of cinnamons to see if the difference is noticable... In the meanwhile, you should just go for it! If you are interested, you can read more about cinnamon at Penzey's Spices. I made these cakes yesterday with the Vietnamese cinnamon. Your recipe was easy to follow. The cupcakes turned out so lovely I didn't want to ruin the subtle flavors with the wrong icing so I did half with chocolate ganache and the other half with mexican chocolate ganache. I used Abuela mexican chocolate. I sprinkled the extra sugar/cinnamon mixture from the churros as a finishing touch. 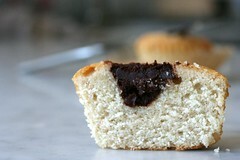 After tasting very sweet cupcakes all week, this is one of the best recipes I've tried. Subtle cinnamon and vanilla cake. Very yummy. Churros were indeed fun to make and the kids got a kick out of the unusual shapes. Thank you for this recipe. It's a keeper! And I believe that Vietnamese Cinnamon does make a difference! I love this blog! I made these cupcakes this weekend (I made mini versions) and frosted with a chocolate ganache. They got RAVE reviews from everyone, although if I had to change one thing, I would make a milk chocolate ganache (rather than dark) or a chocolate buttercream. The frosting that I chose was a little too intense, overpowered the delicate flavor of the cupcake. 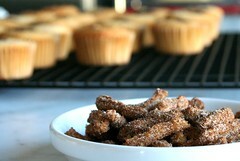 Also, it's totally worth it to make the mini churros, it adds such a professional touch!